The dance activity at Rockbrook is another chance for girls to be active at camp while improving their dancing skills, learning new dance techniques and trying specific dances. All styles are represented: modern, jazz, tap and ballet, even if modern is the most popular. 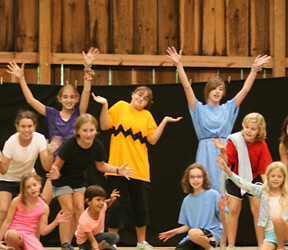 Beyond learning individual dance moves, the dance camp classes at Rockbrook also prepare girls for a performance presented at the end of each camp session. These dance routines are learned and practiced by the 3 different age groups at camp and are always very fun for the girls. 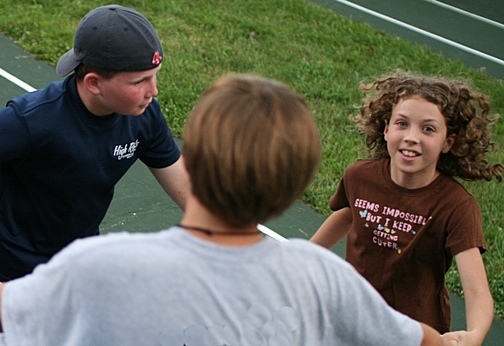 There’s probably one special all-camp event that gets campers more excited than any other, and that’s a dance party with one of the neighboring boys camps. 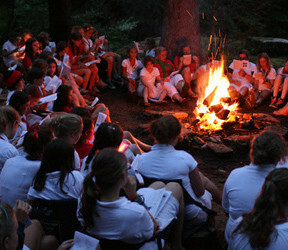 It’s an event campers plan for, in some cases anticipate anxiously, but definitely think of as a BIG deal. 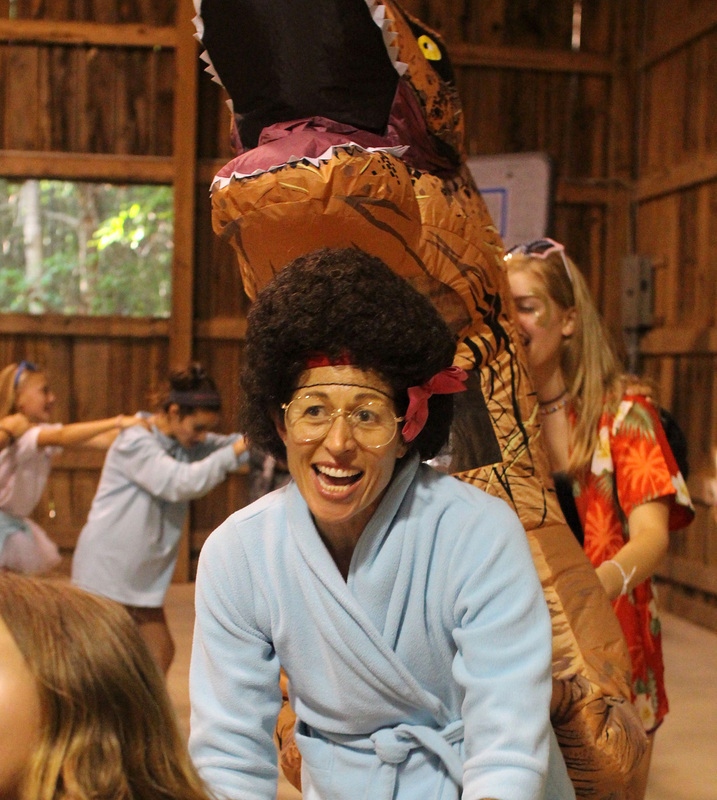 Like most of our special events at camp, it involves dressing up, music, dancing and food— aren’t those the essential ingredients for a fun party after all? —but a camp dance is somehow even better. 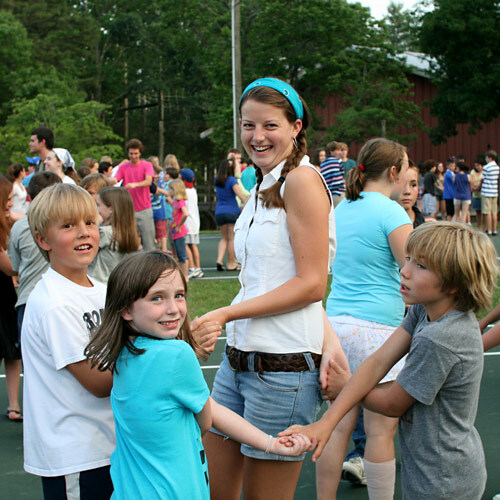 Tonight Camp Carolina and Rockbrook took to dancing! For years now we’ve held two dances simultaneously, dividing the children into older and younger groups, allowing the girls to feel more comfortable around boys their own age. Tonight the Senior girls and Hi-Ups loaded up our buses and vans to travel to Camp Carolina for their dance, and the youngest boys came to Rockbrook for a dance with our Middlers and Juniors. I knew to cover my ears when Chase announced the dance during lunch today, because the girls’ roaring reaction was truly deafening. The rest of the afternoon, conversations were about what to wear and when every girl (well, maybe not all of the Juniors!) would be able to take a shower to get ready. During dinner it was fun to see how the girls chose to get “dressed up.” In addition to special “nice outfits” packed especially for the dance, the older girls in particular were more inclined to wear flamboyant and silly costumes: Hawaiian shirts, traffic vests, cat t-shirts, plenty of tie dyes, and a couple of dinosaur costumes. Even this session’s camp moms Janet and Bentley dressed as old ladies! 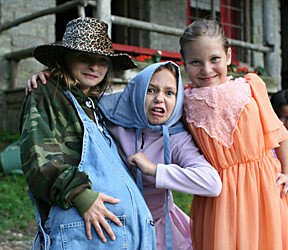 It’s almost expected; whatever you wear to a camp dance, it shouldn’t be too serious. And that’s because the mood of the dances is high spirited and jubilant. For both the younger and the older girls, the dance means grabbing a friend, or a group of friends, and sticking together. No matter what the music, some familiar pop song from Bruno Mars for example, or some other Techno track (which for some reason is a popular genre at Camp Carolina), the dancing involves mostly jumping up and down to the beat, with only the occasional other “moves.” The exception to that are the recognized group dance songs with set choreographed dances like “The Wobble,” “The Cha Cha Slide,” and “Cotton Eyed Joe,” for example. 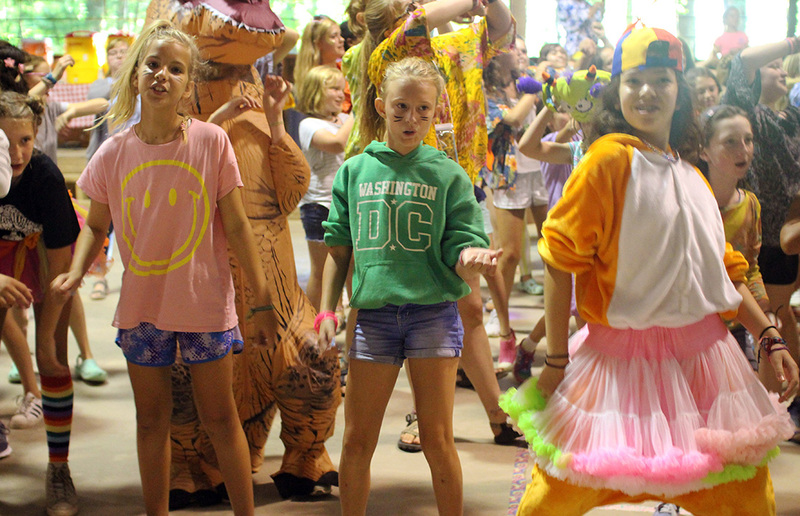 When the dance at Camp Carolina for the older girls and boys switched occasionally to a slow song, you could feel a little tension in the room rising. Some girls were clearly not interested in a slow dance and quickly left the dance floor or grabbed a friend, indicating they were already “out.” A handful of brave boys and girls, though, paired up for an awkward, arms-outstretched, shuffle from side to side. It was hard to ignore this awkwardness, particularly when everyone looked so relieved when a fast song came back on. We wrapped up the dances around 9pm, and after almost 2 hours of jumping around, the girls were sweaty, a little tired, and probably dehydrated. But they were also about as excited as you’ll ever see them. 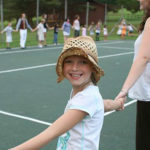 It was non-stop chatter on the bus ride home— comments about who was dancing with whom, that “boy with the weird hat,” the music selection played, how “I danced with a boy 2 years younger than me!”, and how the “whole place smelled like B.O.” With all good things, it was another fun camp night of dancing. 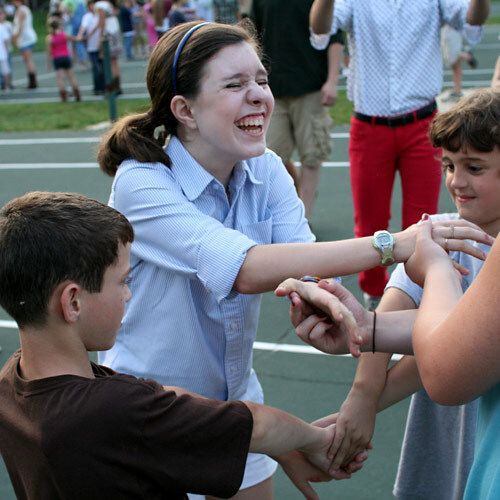 An evening dance party with a neighboring boys’ camp is one of the most exciting events we hold every session. Just like in the movie(s) The Parent Trap, it’s an all-camp event anxiously anticipated and always a BIG deal in the girls’ minds. We have three different camps for boys we dance with: Camp Carolina, High Rocks, and Rockmont, and tonight it was Carolina’s turn to mix with Rockbrook. 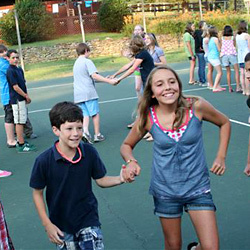 Since we’d have too many children to combine both camps in one location, we have the habit of holding two dances simultaneously, dividing the boys and girls into an older group and a younger group. Tonight the Senior and Middler girls loaded our buses and vans for the trip over to Camp Carolina and the Juniors stayed here at Rockbrook to welcome the youngest boys. Before that, when the dance was announced (Like all special events, we kept it a surprise. ), it was an afternoon of grooming around here. Every shower ran non-stop for two hours, fully testing our tankless hot water heaters. It’s nice to never run out of hot water on a day like this. 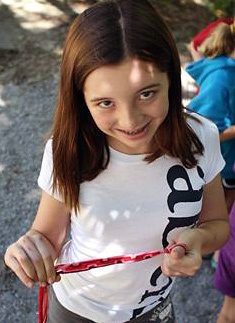 Special shoes appeared, and miles of long hair found a hairbrush… for the first time at camp in some cases, I’d guess. But don’t think everyone’s goal was to get “dressed up” for the dance. Cleaned up yes, but there were also plenty of silly costumes on display. I saw a “catnado” and a unicorn t-shirt, traffic vest, a supergirl and a bear costume. 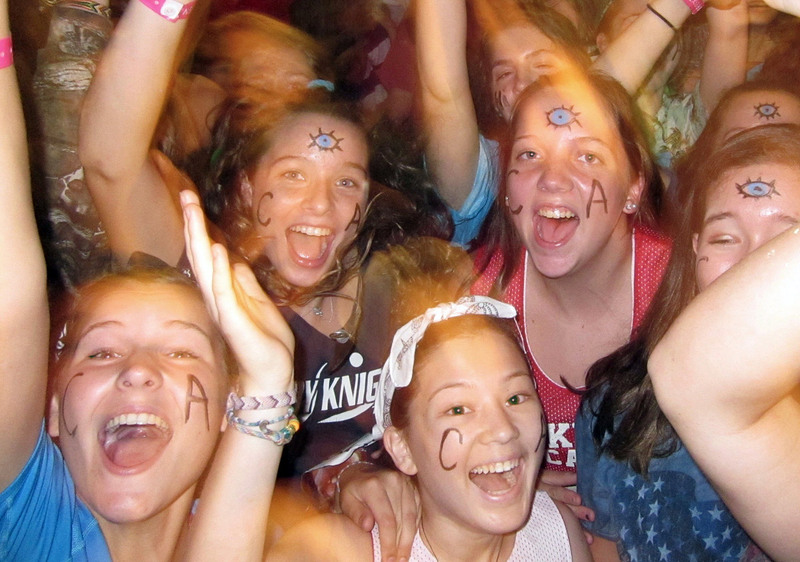 Many of the 9th graders used facepaint to draw a “third eye” on the their foreheads as well as the letters “CA.” Sports jerseys, bandanas, overalls, and tiedyes almost outnumbered “nice” shirts and shorts. 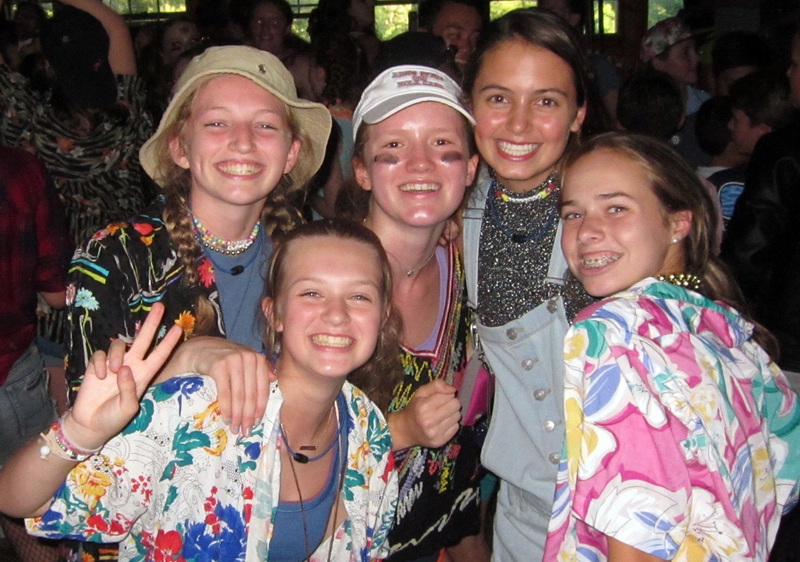 Quite insightfully and in true Rockbrook form, these girls have allowed their playful spirit to outdo any expectation to be “attractive.” They know from experience that trusting that spirit makes things more fun. The two dances themselves have a different feel. The younger kids dancing here in our gym were led by our friend and professional DJ Marcus. He’s an expert at playing music that is fun and familiar to the girls, with an emphasis on group dance songs like “Y.M.C.A,” “The Cha Cha Slide,” and “Cotton Eyed Joe,” for example. 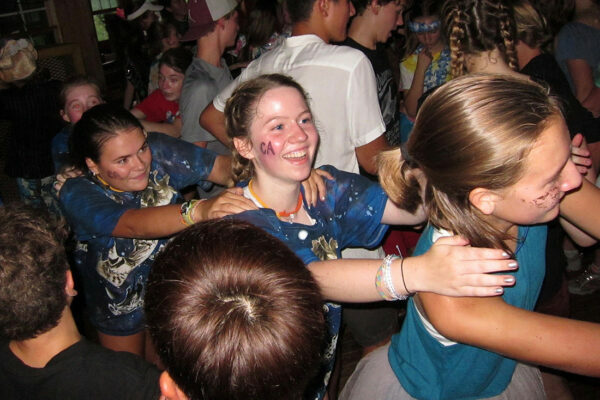 With the counselors dancing right along, the girls had a great time making conga lines, posing for photos, and trying new dance steps with their friends. 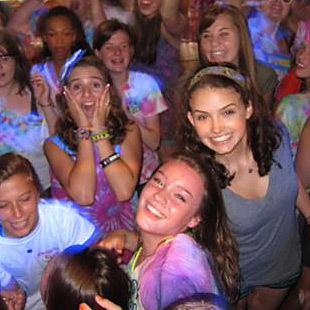 The dance at Camp Carolina for the older girls and boys was held in their dining hall. They set the mood by turning the lights down so a large illuminated disco ball hung in the rafters became the main light. The music selections focused on more current pop songs, with some Hip-Hop, Dubstep and Techno tracks mixed in. There was also an occasional slow song that signaled a few brave boys and girls to pair up for slightly awkward, arms-stretched, side to side shuffle. These slow songs equally inspired some girls to pair up and mimic that same slow-dance style with each other. It seemed to me that most everyone was happy when a fast song returned, replacing the finishing slow song. Group jumping instead of individual shuffling— it’s just better. The bus ride back to Rockbrook was a chance to talk about the dance, to process what happened paying particular attention to who danced with whom, who said what to whom, and how they enjoyed the dance overall. 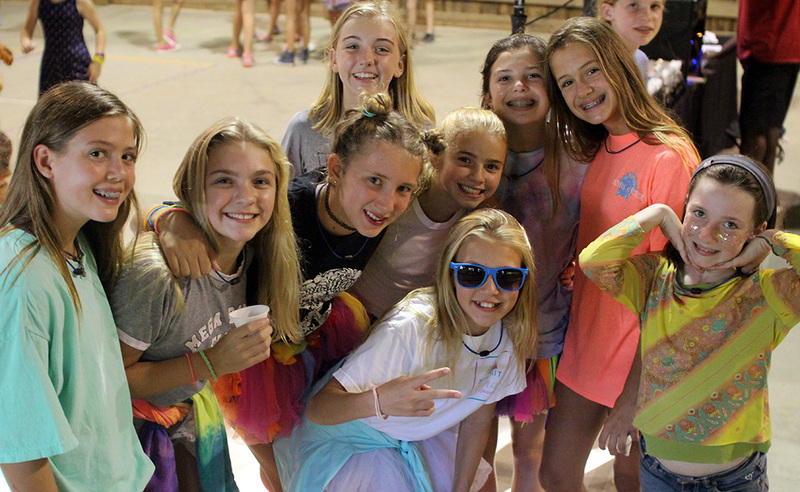 One senior girl said she had “a great time,” and another told me she “loves the Camp Carolina dances.” So the reviews for the girls are positive! It was another great night out dancing. A lot of climbing happens at Rockbrook. Everyday, in fact, there will be a group of girls climbing something, somewhere in camp. The most popular of these climbing activities is our Alpine Tower. It’s a unique high ropes course tower that is 50ft tall and is located in the woods behind our gym (here’s a map of camp to show you. The Tower is to the left on the map). There are dozens of ways to climb the Tower, from easy ladder-like routes to more gymnastic events that require more strength and daring. This makes it excellent for girls of all ages and something that’s always new exciting because there are plenty of new routes to tackle. 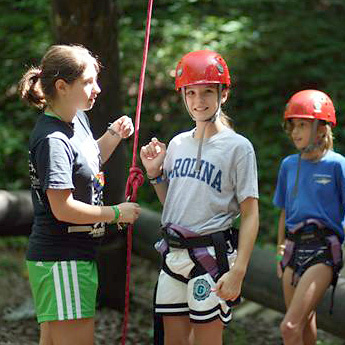 When climbing, the girls are safely on belay, so they are also learning about the climbing equipment, safety rules, and belay commands. In case of rain, we can also move to the gym and hop on our climbing wall. It has several shorter routes up two faces and a corner. When the girls are ready for climbing a real rock, they can head up the trail above camp and climb our very own Castle Rock. There are six different fantastic climbs to choose from, right here in camp! Another interesting phenomenon at camp these days is all the decoration going on. There’s evidence of creativity and imagination all over the place. For example, just about every wrist has several friendship bracelets adorning it (not to mention the “bend-a-back” bracelets girls receive as gifts for doing an unexpected good deed and the green waterslide/swimming bracelet). There are some really complicated patterns being made! In the dining hall, there are colorful painted posters from different special events and birthdays, and in the cabins, wonderful ceramics projects, baskets, drawings, and weavings are stacked up to bring home. I’m sure many will be treasured gifts for you. 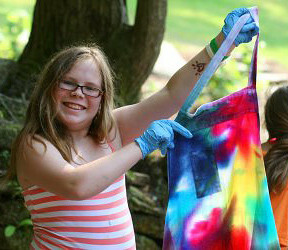 Also today we had a special program available for the campers to learn about moss. A local moss expert, Annie Martin, came for the day to lead 4 “moss expeditions” where the girls hiked a bit to gather different varieties throughout the Rockbrook property. Then each camper made a miniature moss garden to demonstrate what they found. The different colors and textures of our local mosses make these gardens really cool. After dinner, we another camp dance with a local boys camp, this time with High Rocks. Instead of modern music though, this dance was a square dance. 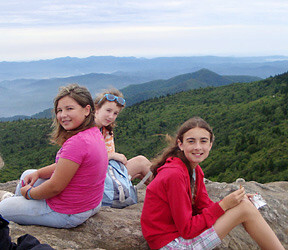 We split the age groups again so our seniors could travel to High Rocks and their younger boys could come to Rockbrook. It took a little while for everyone to relax (seeing boys can jingle the nerves, apparently! ), but once they heard the music and saw that it’s no big deal to be goofy holding hands and stomping your feet, and that it’s fine to “mess up” your do-si-do, the girls really had a good time. We took a break for cookies and lemonade, only to dance some more afterwords. And again for those girls who didn’t want to participate in the dance, we had an alternative; several counselors hung out with these campers and made friendship bracelets while listening to music. It was an exciting evening with lots of smiles and good feelings all around. Saturday began with Rick surprising everyone with a traditional Costa Rican Tico breakfast of black beans and rice, eggs, sliced avocado, salsa and fruit. This was a new culinary experience for most of the girls, but with the fruit, yogurt and cereal bar also available, everyone was able to find something familiar as well. Lunch was Mediterranean with homemade hummus, falafel, pita bread, feta cheese, tzatziki sauce and Greek salad. And to finish off our “International Day,” we had cheese tortellini, marinara sauce, fresh garlic bread and salad. Today, variety was the name of the game in the kitchen! 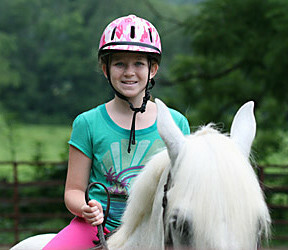 The morning was filled with campers enjoying their most recent set of scheduled activities. 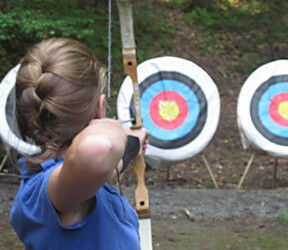 This allowed them to hone their shooting in archery and riflery, glaze a clay sculpture in pottery, or just work on their cannonball technique down at the lake. 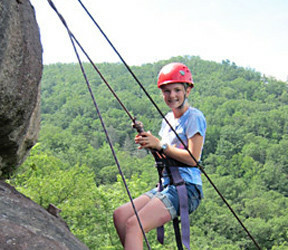 Campers can always find more to do in each activity— a new route to climb, a dance move to learn, a new trail to hike — so they look forward to going back each day, even signing up for a particular activity again. 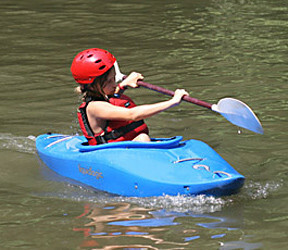 The sign up process at camp allows girls to follow their developing interests and not be locked into something their whole time at camp. 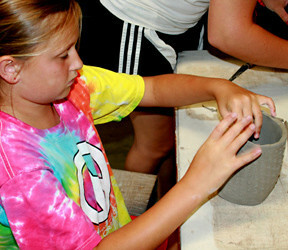 If a camper finds herself really enjoying pottery, for example, she can spend extra time in the studio working with Katie and really make some cool stuff. Having that kind of self-directed choice is a big part of life at Rockbrook. Our evening activity was a perpetual favorite, a camp-wide dance with Camp Carolina, nearby in Brevard. We’ve a long tradition of bringing our Senior girls over there, and their Middler and Junior boys coming to Rockbrook for a dance… two simultaneous dances. Splitting the dances like this allows each to take on different tones, with more age-appropriate music and dancing. 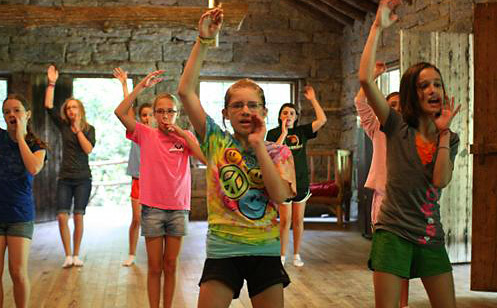 As the older girls are more aerobic jumpers, the younger campers are more interested in their footwork than the boys when it comes to their dancing. The counselors help a great deal leading the way for both groups. It was a lot of good active fun. 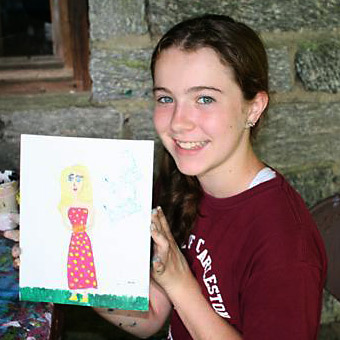 Also, for those girls who preferred it, we had an activity available separate from the dance… an art project in Curosty. It’s nice to have an option if dancing isn’t your thing. We all were happy to return to Rockbrook for the night, back to our haven in the “heart of a wooden mountain,” with our camp friends now filled with stories of the night’s fun. One of Rockbrook’s original camp songs, in fact our official “Camp Song,” begins with the line, “In the heart of a wooded mountain, circled by silvery streams.” It so nicely conveys the character of camp, Rockbrook’s woodsy feel, being tucked in a hillside valley between two rock mountains and waterfalls. Every session for generations, girls have sung this song. So much so, “In the heart of a wooded mountain” has become a shorthand phrase to refer to camp. Here’s the rest of the first verse. The scene of our girlhood dreams. Where friendships so true are born. Today the girls woke up to a big breakfast of eggs, grits, sausage and OJ, along with the usual fruit, cereal and yogurt options. It’s been a little cooler than usual these past few days, so it’s nice to start the day with a good warm breakfast. After a few energetic songs in each line’s Lodge, our “Morning Assembly,” everyone launched into their morning activities. 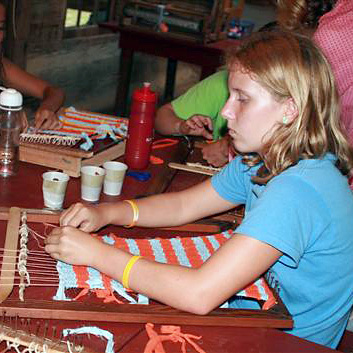 Down in Curosty, Kimberly has been teaching the girls how to weave on flat looms, a simple traditional hand weaving technique. With so many colors of yarn and strips of cloth, there are really cool things being made… hand-woven fabrics soon to become place mats, or sewn into pouches or bags. We’ve also seen really complex friendship bracelets being made in Curosty. That place is buzzin’! The rest of the day was filled with more regular camp activities… painting and drawing, practicing for the play, riding horses, learning to kayak, learning to do a flip in gymnastics, or to throw a clay pot on the wheel. 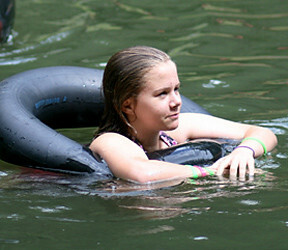 There’s also a nice amount of free time for the girls to just hang out, play in the creek, or head down to the lake for a swim or for some sunbathing. The big surprise for the day, though, was our dance with Camp High Rocks, the boys camp just up the mountain from Rockbrook. We announced the dance right before dinner, giving the girls only about a hour (!) to get “ready.” After dinner (baked ziti, garlic bread, salad, and a shortbread with fruit for dessert), with hair brushed and dressed in clean clothes, we loaded up the buses and drove the whole camp up to High Rocks. The dance was held outside on three tennis courts. This allowed us to spread out and divide everyone into three general age groups for the dancing. It took a while for a few jitters to subside, but soon just about everyone was smiling and having fun. Of course, part of the fun is making mistakes and laughing when you turn the wrong way or grab the wrong arm. 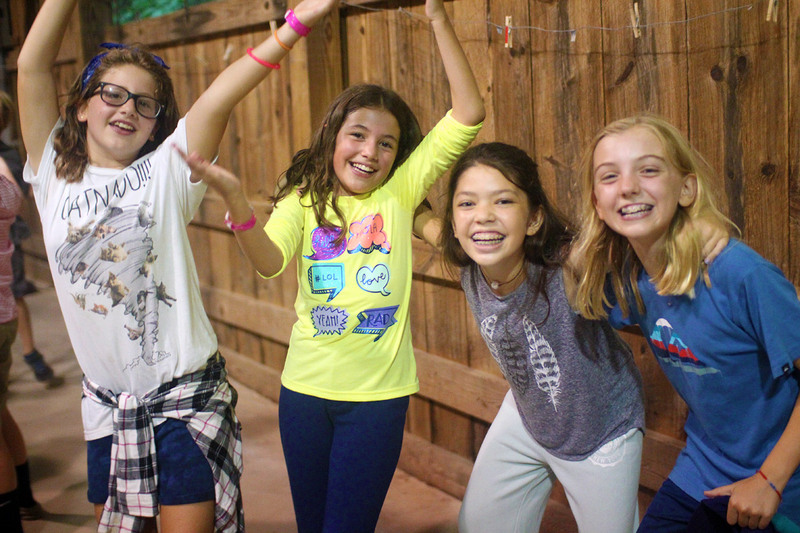 The whole event is lighthearted, a little silly, and surprisingly enjoyable for the girls, even though most of them have never tried square dancing before. 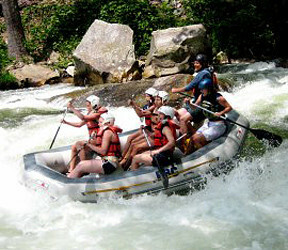 The counselors are right in their too, so this also encourages everyone to relax and enjoy themselves. We all took a short break for lemonade and cookies, only to recharge and dance for another hour or so. As it began to get dark, we said goodbye and thank you, gathered all the girls back into the buses, and made our way back to RBC for the night. It was a wonderful evening. It’s been a long tradition at Rockbrook to spend an evening or two each session having a camp dance with a local boys camp. 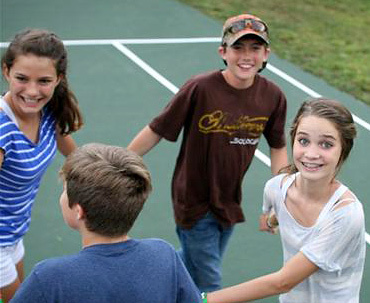 Just like in the movies, our girls will travel over to the boys camp, or the boys will come over to Rockbrook. 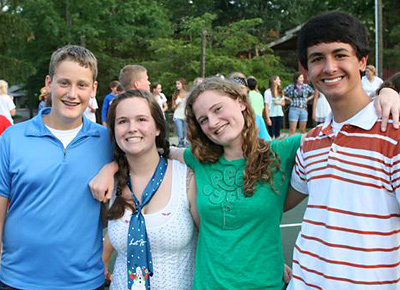 We’ll set up a sound system in the gym, get dressed up and dance around to music selected by the CITs. Over at High Rocks, the boys camp over the mountain from us, we held the dance last summer, which was a square dance, outside on their tennis courts. 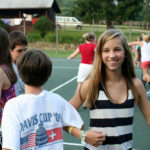 When we go to Camp Carolina, the other boys camp in town, they clear out their dining hall for the dancing. These dances are always very exciting for the girls, partly because they are so infrequent, but also because they involve boys. Since Rockbrook is an all girls camp, having boys around is infrequent too! Of course this can make things a little nervous and awkward at first, but once everyone gets moving, both the girls and the boys relax and have fun. Dance, Dance, every day! 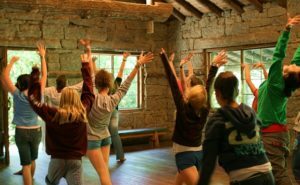 Yes, you can because the overnight summer camps dance program at Rockbrook includes our scheduled dance activity. Camp girls of all ages sign up for the classes down in the Lakeview Lodge (seen here in this photo). One side of the lodge is mirrors and the hardwood floor is perfect for all kinds of dancing: Jazz, Hip Hop, Latin, Country, even some Irish now and then. Of course, the dance instructors will be ready to show you plenty of new cool moves. And don’t forget the great exercise you get zooming around. Can you imagine it? It’s lots of fun. You just never know when the Rockbrook girls will be ready to perform! Here’s a group of “Juniors” (K-4th graders) down at the lake showing off some of the moves they’ve been learning at the dance activity. 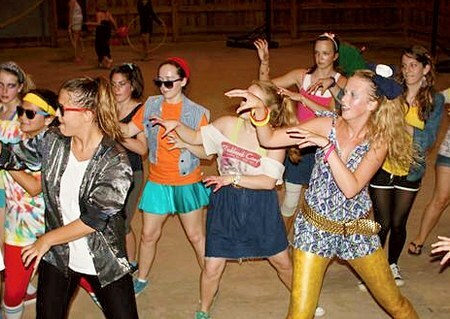 At a summer youth camp for girls, it seems dance and dancing is always just a moment away.